Guests driving to Garma by road will need to travel via the Central Arnhem Rd (24). The Central Arnhem Rd turn off is situated 50km south of Katherine on the Stuart Highway. YYF strongly urges those driving to Garma to print the PDF document below, for the reference of destination points during the 642 km trip from the Stuart highway turn off. If you plan to commute to Gove via the central Arnhem highway from please take care. A high clearance four wheel drive vehicle is essential for guests travelling this route. Be sure to engage 4WD on all dirt roads. Garma guests increase traffic on the Central Arnhem Highway (which is a dirt road), reducing visibility considerably. 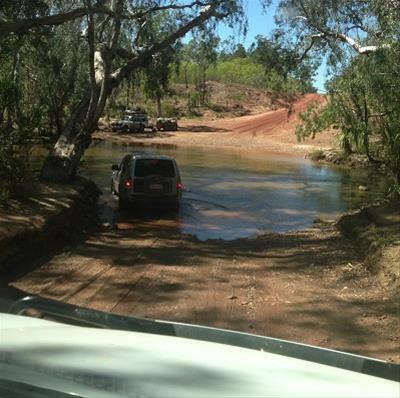 Roads are unsealed and there are some difficult river crossings (including the Goyder River crossing), large corrugations and roads are prone to washouts. Do not swim at the river crossings as salt water crocodiles inhabit these areas. Be particularly careful at night – buffaloes and other animals can stray on to the road. Be sure to drive to the conditions at all times. DO NOT SPEED! Carry plentiful food, fuel and water, spare tyre(s) and a puncture repair kit. A special arrangement has been made so that your Garma ticket doubles as a valid permit to drive this route. Please have your ticket on hand at all times for presentation to local authorities.